A Met Police detective believes he has found a way to predict where deadly stabbings will take place. Man left with life-threatening injuries after being attacked by knifeman matching description of culprit linked to attacks. Home Secretary Sajid Javid will launch an eight-week consultation on Monday following a spate of violence across the country. Scotland Yard said there is a lot of police activity under way to catch the suspect. Thousands more officers will be allowed to use stop and search powers to help combat the surge in knife crime. 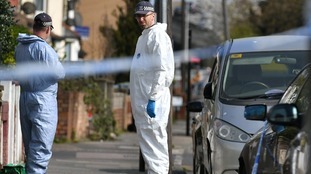 The stabbing was a “vicious and unwarranted attack on a completely innocent man”, police say. While a spate of fatal stabbings have made headlines in London, there are few places in the UK left untouched by knife crime.